Things are starting to get interesting at the multiplex as Hollywood emerges from the end-of-summer doldrums. Several ho-hum weeks are to give way to the first prestige film of the fall season, Paul Thomas Anderson's "The Master," starring Phillip Seymour Hoffman, Joaquin Phoenix and Amy Adams, each of whom will find themselves in the Oscar hunt. The weeks to follow promise new films from Clint Eastwood, Joseph Gordon-Levitt, Ben Affleck, Brad Pitt, Halle Berry, Tom Hanks, Denzel Washington, Steven Spielberg, and Jennifer Lawrence, as well as the next chapters from "Twilight" and 007. 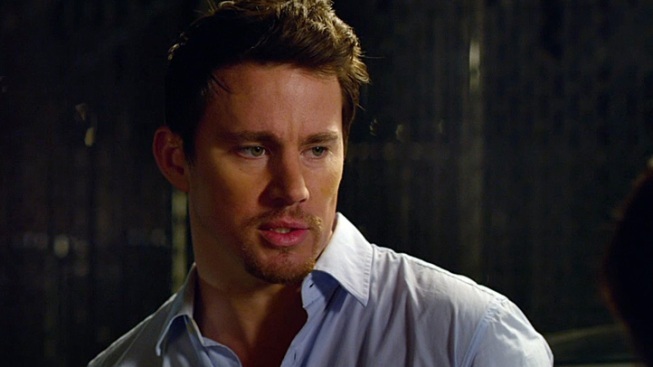 Hollywood's 2012 Man of the Year, Channing Tatum, leads an all-star-ish cast in this ensemble comedy about a group of high school friends who come together for the reunion. Co-stars Justin Long, Kate Mara, Chris Pratt, Brian Geraghty, Anthony Mackie, Rosario Dawson, Oscar Isaac, Lynn Collins and Max Minghella. Milla Jovovich and husband Paul W.S. Anderson return with the fifth installment of the seemingly ceaseless battle against the Umbrella Corporation and their horde of flesh-eating zombies. This Disney classic about a lost fish returns. Phillip Seymour Hoffman, Joaquin Phoenix and Amy Adams star in Paul Thomas Anderson's new film loosely inspired by the life of L. Ron Hubbard and the birth of his Church of Scientology. Karl Urban and Olivia Thirlby star in this reboot of the Sylvester Stallone comic adaptation about a ruthless lawman sent into a drug lord's den to clean the place out. Jake Gyllenhaal and Michael Pena star as partners on the LAPD who find themselves in the cross-hairs of a dangerous drug cartel in this new film from David Ayer, writer of "Training Day." Jennifer Lawrence stars as a young woman who moves in next door to a guy who is the lone survivor of his parents' grisly murder at the hands of his sister. Of course she falls for him, and this get hairy. Clint Eastwood stars as an aging baseball scout whose daughter, Amy Adams, tags along to help him. Along the way they run into a rival scout, Justin Timberlake, who is an old friend of Eastwood's and naturally takes an interest in Adams. Joseph Gordon-Levitt stars as a hitman who specializes in killing people sent back from the future, but things go awry one day when his mark turns out to be his older self, played by Bruce Willis. Maggie Gyllenhaal and Viola Davis star as a pair of mothers who try to save their kids' school by launching a coup against a corrupt union and administration. Co-stars Holly Hunter and Ving Rhames. Anna Kendrick stars as a young woman who heads off to college where she finds herself roped into joining the girls' a cappella group as they prepare for a big competition. Think "Bring It On" meets "Glee." Tim Burton finally completes the short film he made some 30 years ago, about a boy willing to do whatever it takes to bring his beloved pooch back from the dead. Jennifer Garner stars as a woman poised to take over from her husband as a butter-carving champion, but finds herself challenged by a young upstart. Said to be based on the 2008 Democratic primary race between Hillary Clinton and Barack Obama. Mathew McConaughey, John Cusack, Nicole Kidman and Zac Efron star in this crime thriller about an accused murderer whose girlfriend enlists the help of a journalist and his younger brother to prove his innocence. Kevin James stars as a teacher who takes up MMA fighting to raise enough money to save his school's music program. Colin Farrell, Sam Rockwell, Woody Harrelson, Abbie Cornish, Olga Kurylenko, Gabourey Sidibe, Tom Waits and Christopher Walken star in the titles roles of Martin McDonough's new crime comedy about a struggling screenwriter who gets caught up in a dognapping gone wrong. Brad Pitt stars as a man hired by the mob to find out who robbed a high-stakes poker game. Co-stars Scoot McNairy, Ben Mendelsohn, Ray Liotta, Richard Jenkins, James Gandolfini and Sam Shepard. Yeah, we can't believe they’ve already made four of these either. A documentary about an inner-city chess team that grows into the best middle school program in the nation and manages to win the high school championship. John Hawkes and Helen Hunt star in this film based on the true story of Mark O'Brien, a man in an iron lung who hires a sexual surrogate to help him lose his virginity. Denzel Washington stars as a commercial airline pilot hailed as a hero for making a miraculous emergency landing—until it's suspected that his substance abuse was what original put the plane and its passengers in danger. Russell Crowe, Lucy Liu and RZA (of Wu Tang fame) star in the rapper's directorial debut, about a 19th-century blacksmith who must forge a series of elaborate weapons to protect his village from a traitor. John C. Reilly lends his voice to this cartoon about Ralph, who after more than three decades as the villain of a video game, escapes via the power cord and into other games where he helps the heroes until he learns he may have accidentally unleashed a threat to the whole arcade. "This Must Be the Place"
Sean Penn stars as a former rock star who honors his estranged father's death by going hunting for the Nazi war criminal who tormented him during WW II. Daniel Craig is back as Bond, in this new story in which 007 goes up against a dangerous villain, played by Javier Bardem, and uncovers secrets from M's past that make him question his loyalty. Daniel Day-Lewis racks up his fifth Oscar nomination, this time for playing our 16th president, Abraham Lincoln, in the historical epic from Steven Spielberg. "The Twilight Saga: Breaking Dawn – Part 2"
Leo Tolstoy's classic love triangle is brought to life by Keira Knightley, Jude Law and Aaron Taylor-Johnson, with help from director Joe Wright and screenwriter Tom Stoppard. Director Ang Lee adapts Yann Martel's novel about a boy who survives a shipwreck only to find himself stranded on a lifeboat with a tiger, orangutan, zebra and hyena. Chris Hemsworth stars in this remake of the '80s Cold War classic about a group of high school kids who take to the hills to beat back an army of foreign invaders. Bradley Cooper stars as a man, forced to live at home after an stint in a mental hospital, who meets a young woman, played by Jennifer Lawrence, who offers to help him win back his wife. Guess who falls for each other… Go ahead, guess. Marion Cotillard stars as a killer whale trainer who suffers a terrible accident that leads her to an unusual relationship with a younger man, played by Matthias Schoenaerts. Written and directed by Jacques Audiard ("A Prophet").